Background: Chronic obstructive pulmonary disease (COPD) and pneumonia are leading causes of morbidity and mortality and are frequently comorbid. Studies of systemic corticosteroids in pneumonia have shown conflicting outcomes, whereas studies in acute exacerbations of COPD (AECOPD) have shown significant benefits. No studies have evaluated systemic corticosteroids in patients with both an AECOPD and pneumonia. Purpose: To evaluate the use of systemic corticosteroids in patients with both an AECOPD and pneumonia. Patients and Methods: Patients with a diagnosis of both COPD or obstructive chronic bronchitis with exacerbation and pneumonia admitted to the University of Colorado Hospital between July 1, 2012 and May 20, 2016 were retrospectively evaluated. Patients who received systemic corticosteroids were compared to those that did not. The primary outcome was length of hospital stay (LOHS). Secondary outcomes were in-hospital treatment failure, a composite of intensive care unit (ICU) admission, ventilation, and escalation of steroid therapy, 30-day AECOPD or pneumonia readmission, and 30-day mortality. Results: A total of 138 patients were included-- 89 in the steroid group and 49 in the non-steroid group. No significant differences in baseline characteristic were noted. No difference was seen in mean LOHS (4.7±3.2 versus 4.2±2.1 days, p=0.27), in-hospital treatment failure (7% versus 4%, p=0.72), 30-day readmission or 30-day mortality between the steroid and non-steroid groups, respectively. There was a difference in mean LOHS for patients with severe pneumonia between the steroid and non-steroid groups (6.0±4.0 versus 4.3±1.8; p=0.03). Conclusions: This study suggests that systemic corticosteroids may not provide a clinical benefit to patients with an AECOPD and pneumonia. Systemic corticosteroids are standard of care in the management of an acute exacerbation of chronic obstructive pulmonary disease (AECOPD).9 Studies have shown that their use improves short-term lung function and reduces treatment failure rates, 30-day relapse, and length of hospital stay.9,10 However, studies examining the effectiveness of systemic corticosteroid therapy in an AECOPD have universally excluded patients with pneumonia.10,11 The use of corticosteroids in community-acquired pneumonia (CAP) has been controversial with some studies showing a faster improvement in clinical stability, shorter length of hospital stay, and decreased mortality, while others have shown no benefit with an increase in side effects (especially hyperglycemia).12,13 Studies examining the use of systemic corticosteroids in patients with CAP have included only small numbers of patients with COPD.14 Therefore, the benefits of systemic corticosteroid use in patients with an AECOPD and CAP remains unknown. The purpose of this study was to examine the use of systemic corticosteroids in patients with an AECOPD and CAP. We hypothesized that there would be no statistically significant difference in length of hospital stay between patients with an AECOPD and CAP who received a course of systemic corticosteroids and those who did not. This was a retrospective evaluation of patients 40-89 years of age admitted to the University of Colorado Hospital (a 648-bed urban academic medical center) between July 1, 2012 and May 20, 2016 with an AECOPD and CAP. Patients during this period with a diagnosis of either COPD (International Classification of Diseases-9th Revision [ICD-9] code 496, ICD-10th Revision [ICD-10] code J44.9) or obstructive chronic bronchitis with exacerbation (ICD-9 code 491.21, ICD-10 code J44.1) on their hospital diagnosis list and an admission diagnosis of pneumonia (ICD-9 code 486, ICD-10 code J18.9) were examined for inclusion. Patients were excluded if they had a diagnosis of hospital-acquired pneumonia, no radiographic evidence of pneumonia, no evidence of an AECOPD, an immunocompromised condition (human immunodeficiency virus, solid organ or bone marrow transplant, or receiving immunosuppressive therapy), asthma or other lung disease, developed septic shock with the need for vasopressors, received oral or IV corticosteroids within 30 days of admission, or died during hospitalization. All data were extracted from the electronic health record, EPIC (Madison, Wisconsin). The Colorado Multiple Institutional Review Board approved this study. The primary outcome was length of hospital stay. Our main secondary outcome was in-hospital treatment failure, which was defined as intensive care unit (ICU) admission or mechanical or non-invasive ventilation as a result of treatment failure, or escalation of steroid therapy. Patients were only included up to once for this outcome, even if they met more than one criteria for it. We also assessed each of these components individually for both groups. ICU admission and ventilation were attributed to treatment failure if they occurred 6 hours or more after the first dose of steroid (steroid group) or 6 hours or more after hospital admission (non-steroid group). Other secondary outcomes included 30-day AECOPD or pneumonia readmission and 30-day mortality in patients with evaluable data. In addition to comparing outcomes in the steroid and non-steroid groups, we also performed a subgroup analysis on patients admitted with severe pneumonia, i.e., having a pneumonia severity index (PSI) score of IV or V.
Common adverse events caused by systemic corticosteroid were evaluated. To assess for hyperglycemia, we recorded the frequency of insulin administration in patients without a diagnosis of diabetes and the frequency of hyperglycemia (serum glucose >200 mg/dL) requiring additional insulin (lispro) therapy in patients with a diagnosis of diabetes. To assess for psychiatric adverse effects (acute psychosis, agitation, anxiety, or insomnia) we recorded the frequency of a new order for an antipsychotic or anxiolytic medication for psychosis, agitation, or anxiety and the frequency of a new order for a sedative/hypnotic agent for sleep. To assess for edema, we recorded the frequency of a new order for a loop diuretic to treat edema. For comparisons between the 2 groups, the Fisher’s exact test was used for categorical variables and continuous variables were evaluated using a student t-test for non-matched samples with unequal variance. All tests were 2-tailed and a p-value <0.05 was considered significant. All continuous variables are reported as a mean±standard deviation. Based on previous studies, we estimated that approximately 64 patients would be needed in each group to have 80% power to detect a 2-day difference in length of stay assuming a population mean length of stay of 8 days, a standard deviation of 4 days, and an alpha level of 0.05.10,12,16 All statistical calculations were performed using Graph Pad 2016 (San Diego, California). A total of 138 patients were enrolled in this study based on inclusion and exclusion criteria. Eighty-nine (64%) were included in the steroid group, and 49 (36%) in the non-steroid group. The patients in the steroid and non-steroid groups were similar with no significant differences in key characteristics (Table 1). The steroid group received a mean daily dose of 65.3±86.3 mg prednisone equivalents. Twenty-eight percent of patients received at least 1 dose of IV methylprednisolone. The mean total duration of steroid therapy was 7±4.7 days with 82% of patients receiving ≤ 7 days total. The percentage of patients with a guideline recommended initial antibiotic regimen for CAP was similar between the 2 groups with 74% in the steroid group and 80% in the non-steroid group receiving the combination of a beta-lactam or vancomycin plus azithromycin or doxycycline or levofloxacin alone (p=0.54).17 Fifty-one percent of patients in the steroid group and 48% in the non-steroid group (p=0.10) received an inhaled corticosteroid (ICS) prior to admission. 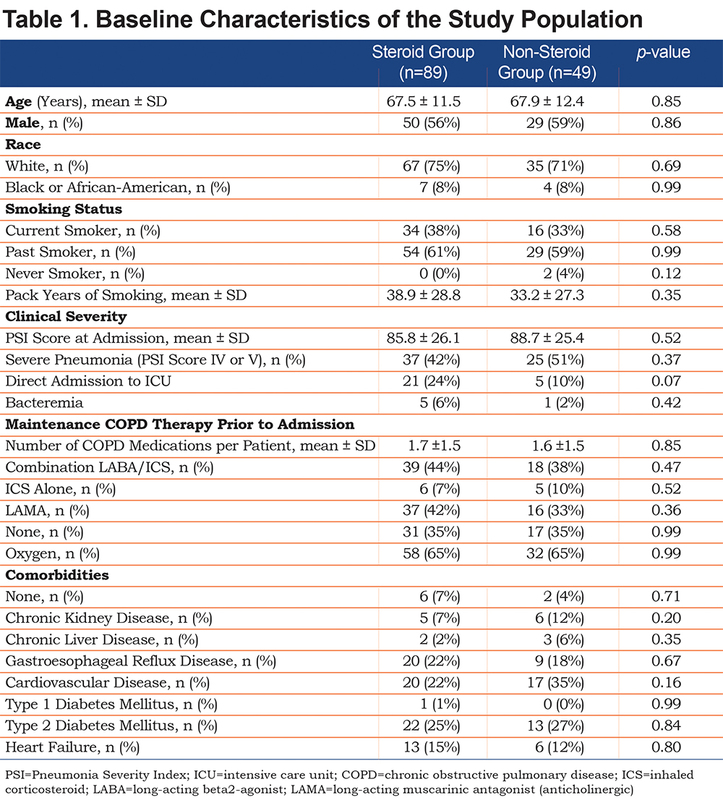 One or more maintenance COPD meds were continued during hospitalization in 58.4% of patients in the steroid group and 44.9% of patients in the non-steroids group (p=0.15). There was no difference in the primary outcome with the steroid group having a mean length of stay of 4.7±3.2 day and the non-steroid group of 4.2±2.1 days (p=0.27). 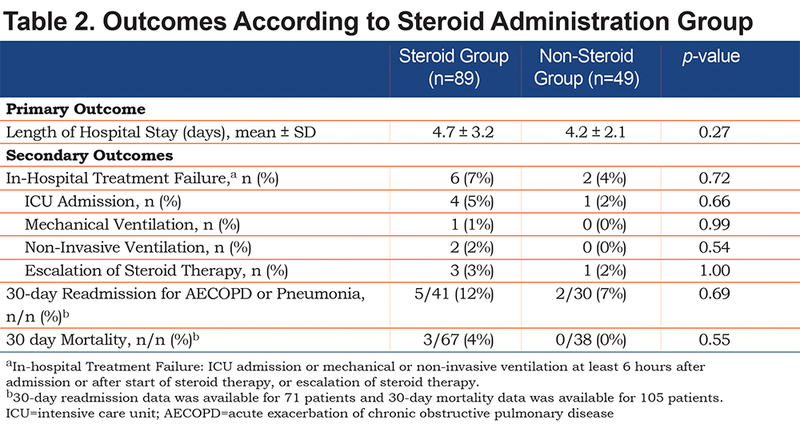 There was also no difference in the secondary outcomes of in-hospital treatment failure, 30-day readmission for an AECOPD or pneumonia or 30-day mortality between the steroid and non-steroid groups (Table 2). Although we observed more hyperglycemia in the steroid group, there was no difference between groups in any of the adverse events (Table 3). Among patients with severe pneumonia, there was no difference in mean age or mean PSI score between the steroid and non-steroid groups. There was also no difference in the frequency of in-hospital treatment failure, 30-day readmission or 30-day mortality. However, there was a significantly longer length of hospital stay in the steroid group than in the non-steroid group (6.0±4.0 versus 4.3±1.8 days, p=0.03) (Table 4). This is the first study to evaluate the use of systemic corticosteroids in patients with an AECOPD and CAP. Systemic corticosteroids were commonly prescribed in this patient population with 64% of patients receiving steroids. However, the use of systemic corticosteroids in this population, did not result in a shorter length of hospital stay or a lower rate of in-hospital treatment failure. Among patients with severe pneumonia, length of hospital stay was significantly longer in the steroid group compared to the non-steroids group, despite a similar mean age and PSI score. Our results are inconsistent with outcomes observed in studies of systemic corticosteroids in patients with an AECOPD. In patients with an AECOPD, systemic corticosteroids have demonstrated reductions in treatment failure, reduced 30-day relapse, and reduced length of hospital stay.9,10 These studies, however, excluded patients with pneumonia. While studies have shown benefits with systemic corticosteroids in CAP,18-21 several studies have showed no benefit, similar to our study.22-24 A prospective observational study by Salluh et al 23 evaluated the impact of systemic corticosteroids in 111 patients with severe CAP requiring mechanical ventilation. While mortality rates were similar between patients treated with or without corticosteroids, ICU and hospital lengths of stay were significantly longer in the corticosteroid group. A quarter of the patients included in this study had a diagnosis of COPD; however, a higher percentage of patients with COPD were included in the corticosteroid group compared to the non-corticosteroid group (38% versus 10%, p=0.001). The median dose and duration of corticosteroids administered was 60 mg/day methylprednisolone equivalent for 7 days. This study included patients with more severe CAP, but used a steroid dose similar to our study. A single center, prospective randomized trial compared prednisolone 40 mg daily for 7 days to placebo in 213 patients hospitalized with CAP.24 No difference in the primary outcome of clinical cure at day 7 or 30 or in length of hospital stay was demonstrated. Analysis of patients with severe pneumonia also did not show a significant difference. A significantly higher rate of late failure (>72 hours after admission) was seen in the corticosteroid group compared to the non-corticosteroid group (19.2% versus 6.4%, p = 0.04). Approximately 20% of patients included in this study had a history of COPD. This study showed comparable results to our study. The population enrolled and the dose of corticosteroids was similar. The major strength of our study is that it is the first to evaluate the use of systemic corticosteroids in patients with an AECOPD and pneumonia. However, due to several limitations the results need to be interpreted cautiously. The greatest limitation of our study was the retrospective design. While the baseline characteristics of the groups were similar, it is impossible to account for all possible confounding variables that could have affected the results. Another significant limitation was the number of patients with evaluable 30-day readmission or 30-day mortality data. Follow-up data for many patients was not available. Data collection for this study included patients who were admitted over nearly a 4-year time span. It is possible that changing practices in the management of AECOPD or pneumonia could have impacted our results. Last, our sample size was small and our study groups were not balanced with the steroid group being much larger than the non-steroid group. It is unknown if the results would have been different if more patients had been included, especially in the non-steroid group. However, we feel that increasing the sample size to reach power would not have resulted in a statistically significant difference in favor of the steroid group. Our data suggest that the use of systemic corticosteroids in patients with an AECOPD and pneumonia does not decrease length of hospital stay or treatment failure rates and may increase the risk for hyperglycemia. Additionally, the use of systemic corticosteroids in patients with severe pneumonia, as defined by the PSI score, significantly increased length of hospital stay. We believe that the results of this study support the need for further research into the use of systemic corticosteroid in patients with an AECOPD and pneumonia. 1. Kochanek KD, Murphy SL, Xu JQ, Tejada-Vera B. Deaths: Final data for 2014. National vital statistics reports; 2016;65(4). https://www.cdc.gov/nchs/data/nvsr/nvsr65/nvsr65_04.pdf Published June 2016.Accessed November 2017. 2. World Health Organization (WHO)-Media Centre. Chronic obstructive pulmonary disease (COPD) fact sheet. WHO website. http://www.who.int/mediacentre/factsheets/fs315/en/ . Published November 2016. Accessed July 2017. 4. Erkan L, Uzun O, Findik S, Katar D, Sanic A, Atici AG. Role of bacteria in acute exacerbations of chronic obstructive pulmonary disease. Int J Chron Obstruct Pulmon Dis. 2008;3(3):463-467. 5. Centers for Disease Control and Prevention(CDC): National Center for Health Statistics. Pneumonia, FastStats. CDC website. https://www.cdc.gov/nchs/fastats/pneumonia.htm. Published January 2017. Accessed July 2017. 26. Ferrer M, Torres A, Reyes S, et al. Inhaled corticosteroids (ICS), systemic inflammatory response and mortality in community-acquired pneumonia (CAP). Eur Resp J. 2011;38(Suppl 55):4713. 33. MacDonald M, Osadnik C, Qiu M, Vasanthakumar S, King P, Bardin P. Eosinophilia is common in copd exacerbations and associated with non-infectious aetiology. Am J Resp Crit Care Med. Th2016;193:A5185.